International Strategic and Security Studies Programme (ISSSP), National Institute of Advanced Studies (NIAS), Bangalore organized a conference on June 9-11, 2016. 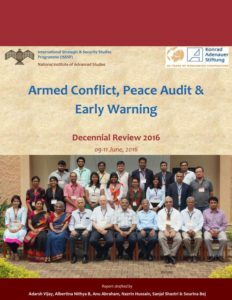 The conference analysed armed conflicts and peace processes in the region during the last ten years. Leading scholars, former practitioners and media professionals took part in the three-day conference held at NIAS campus in Bangalore. The focus of discussions included Afghanistan, Pakistan, multiple conflicts and peace processes within India (J&K, Northeast and Naxal), Nepal, Bangladesh, Myanmar, Sri Lanka and Maldives. The findings are likely to be published in early 2017. The conference was organised by the NIAS in collaboration with the Konrad Adenauer Stiftung (KAS). The event report has been prepared by Adarsh Vijay, Albertina Nithya B, Anu Abraham, Nazrin Hussain, Sanjal Shastri & Sourina Bej.